Regular forum members Curmudgeon and Mozza had an interesting session on the water the other day. It was such a good read in the fishing reports section that I asked them if I could publish here. It's not often fishing is this good, but Mozza seems to be among them a lot lately! Here is their story. Yesterday afternoon, Mozza and I were tooling around the mackerel patch towing wolf herring when a 20lb+ mackerel took to the sky about a hundred yards in front of us. That fish must have gone 20 feet into the air, I kid you not. We were like, "Wow! Did you see that?! Whoa! There's another one! And another one!". More and more long silver bullets were arcing across the sky. There were literally dozens of mackerel getting airborne across a quarter acre of water. If we'd continued on our troll line, we'd have driven right through the middle of it all. "Stuff this!" called Moz. "Wind the lines in. We gotta get in there quick and have a cast!" We got the lines halfway back to the boat when they both got slammed. Mozza's stayed stuck, and a 20lb spaniard was reclining in the ice slurry. The aerial activity had come to an end, so it was back to trolling. 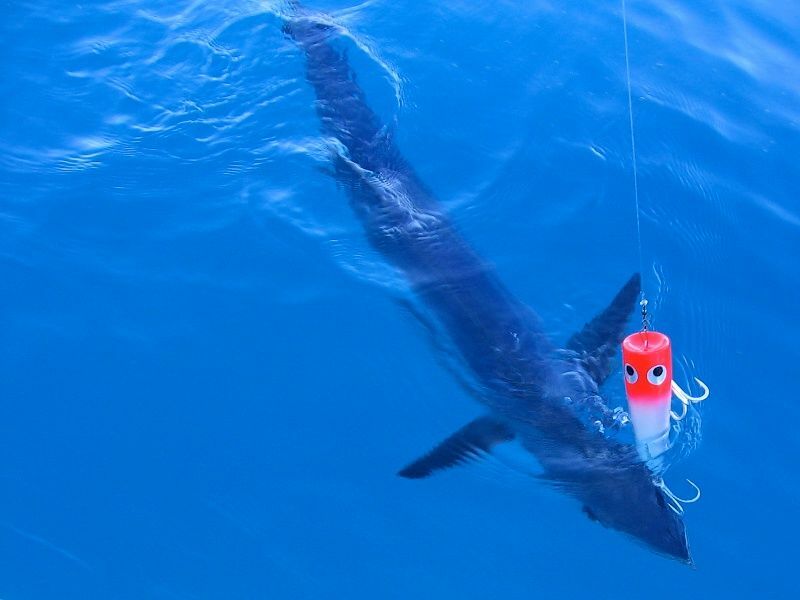 Taking a cue from one of the other boats, Moz tied on a big popper to drag behind us. Bugger me if a 30lb mackerel didn't make a meal of that in double quick time. A quick pic for the unbelievers, and he was released. The purpose of this trip was two-fold. Mozza wanted to put me onto my first substantial spanish mackerel, bless him. He tried. Hey, I tried too. I mean I really tried. I jigged, I trolled, I poppered, I prayed. Luck was just not with me. 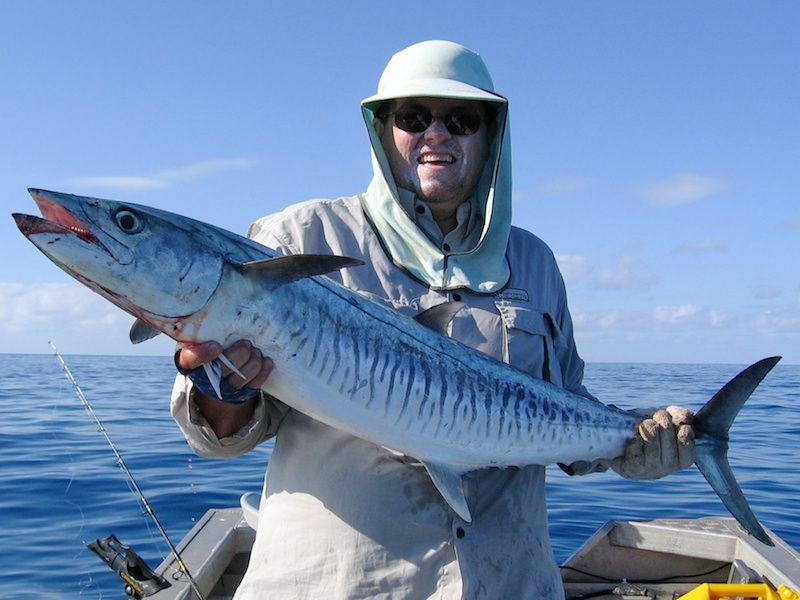 I was connected to several solid mackerel - temporarily - both on jigs and trolled wolfies, but I could not get one to the boat. Hopeless. Eventually, Mozza took pity on me and called an end to the mackerel session to move back toward the cape to fulfill our other goal. Mozza's quadrella. Spanish mackerel, coral trout, fingermark and barra, all in the same day. Yes, he's an ambitious SOB. So we jigged up a couple of livies, anchored and waited. We didn't have to wait long. A little gold spot climbed on my line. Too small to keep, but the first thing I'd gotten to the boat all afternoon. My livey survived that experience, so was quickly redeployed to the bottom. A minute later, he was absolutely monstered. That experience lasted all of about 30 seconds, finishing with a monumental wipe out in the reef. Fifty pound braid, eighty pound leader, twenty-two pounds of drag on the Tyrnos and I didn't stand a chance. My confidence was well and truly shattered. Things went quiet, so as the sun set, we made the decision to try for a barra right in close to the cape. After half an hour of barra trolling, we hadn't had a touch. We passed the time reflecting on what a great afternoon it had been. We'd seen whales. We'd seen flying mackerel. The ocean was oily smooth. If I'd have caught some damn thing - anything - I'd have been positively delerious. Moz cheerily asked, "Do you want that last beer, Brian?" I snapped back, "Bloody oath, but not until I've caught something worth celebrating!". I was sincerely beginning to doubt that I would. For the next trolling run, I tied on my fifth favourite barra lure. On my current run of luck, I was convinced that if I tied on one of the top four, I'd only lose it to a bloody snag. Best decision I made all day. First lap with that lure scored me a 66cm barra. What a relief! I cracked the last stubby, took a swig and lobbed the lure back out. Seconds later, I was on again! 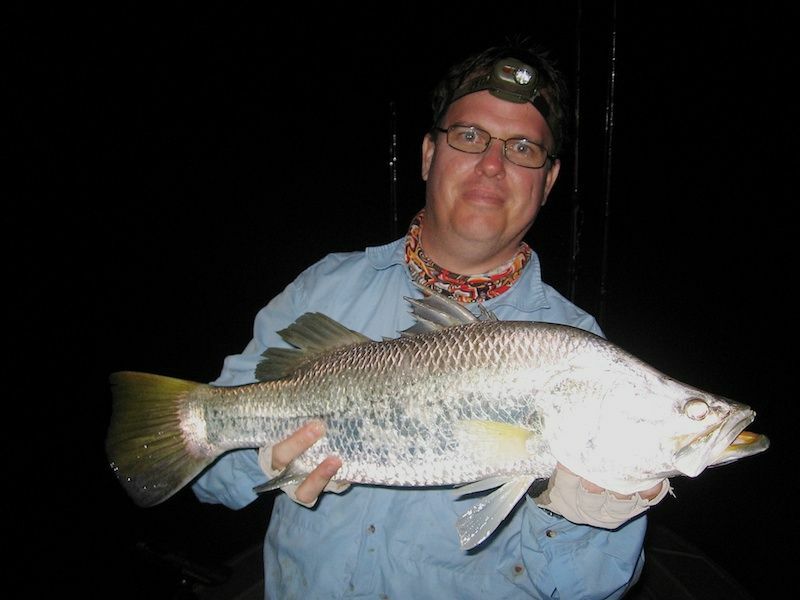 61cm barra (released) and still not halfway through my beer. Another two mouthfuls... bang! Dropped him. We reset the lines again only to have a 56cm barra promptly jump on that same lure. Three barras, one beer. Unreal. And I don't muck around drinking beer in hot weather. Dropped another one and landed a 51cm and a 48cm before we called it quits at around 8:30. Doug was shaking his head in disbelief. He'd hooked two barras but didn't land either. Fast, smooth, moonlit ride back across the bay. Another awesome day in paradise. ps. No beer was spilt in the making of this story.